Trendsetting Los Angeles juice and raw food bar Moon Juice is leading the way in educating consumers on healthy, under-the-radar ingredients and specialty foods with the recent launch of its online apothecary and pantry. We spoke with founder Amanda Chantal Bacon, who has traveled the world carefully sourcing the site’s selection, to find out which items she thinks every healthy kitchen should stock. Here’s why you need bee pollen in your pantry now. Discovering this whole food protein was life-changing for me. It’s hard to find plant-based mega doses of protein that aren’t high in sugar, carbs, fat and aren’t soy-based. Make sure you find one that’s organic, raw, sprouted and bio-fermented. This whole body nourisher is made from whole grain brown rice, which helps support healthy muscle growth and recovery. There isn’t a day that goes by that I don’t have maca. Maca is an Andean root dried and ground into a nutty and complex caramel-flavored powder. It’s a very potent adaptogen, which means it helps the body adapt to stress by countering the negative effects of tension and anxiety, while boosting the endocrine system. Maca delivers abundant energy, mental stamina, hormonal balance, enhanced libido and an elevated mood. Tocotrienols is a creamy powder derived from rice. It’s a super-concentrated source of vitamins E, D and antioxidants, and has tissue-regenerating, inflammation-taming, immunity, muscle-boosting and toxin-removing powers that directly reach the brain, liver, heart, lungs and kidneys. I love eating bee pollen straight out of the jar as an energy-boosting mini snack. Bee pollen is a mystical dance between flowers and bees, yielding a predigested, easily assimilated, alkaline food dense with antioxidants, minerals, vitamins, 22 essential amino acids and bio-available proteins. Its high levels of vitamin B combat acne and wrinkles, while also soothing allergies. It’s a potent aphrodisiac, blood nourisher and muscle food that supports fertility and stamina, muscle growth and definition and recovery from exercise. Perhaps the most important thing in my kitchen are live and active, quality probiotics. Not only do I use them as digestive support, but I’m always creating fermented foods and using them. Probiotics nurture intestinal microflora, heal the gut and recolonize intestines with organisms that defend against disease, viruses and yeast. They boost nutrient potency and help with assimilation of all the other healthy foods you’re eating, while helping to decrease sugar cravings. A healthy gut is truly the key to success; you’ll immediately start to notice smoother digestion, increased energy, elevated mood, glowing skin, stronger immunity and potent liver cleansing. I throw a teaspoon of cordyceps into every morning smoothie I make. I’m always looking to support my adrenals and thyroid for truly sustainable energy. The cordyceps mushroom exponentially increases cellular oxygen absorption, boosting the immune system and making a powerful tonic for strength, stamina, energy, lung and brain function. Raw, organic cacao has my favorite flavor on the planet; this and green juice are the only things I truly crave consistently. My preference is always a raw, shade-grown, heirloom Arriba Nacional cacao that’s fermented and sun-dried. Cacao’s divine mineralizing medicine is powerful, intoxicating and high-functioning. I use its rich flavor in smoothies with other powerful herbs and in all types of healthy desserts and treats to feel the rush of blissful endorphins, mood-boosting hormones, increased brain flow, boosted metabolism and sparked libido. One of my favorite fats to gently heat or even add into coffee or warm tonics for an extra boost is ghee. The value of pure ghee is in its vibration and nourishing influence. When ghee is made properly from cultured butter, it provides very deep nourishment to all of the tissues of the body and the brain. I keep dried organic petals on hand to throw into tea blends, chocolate cakes, use in a steamed rice dish with pistachios and to throw into cocktails and syrups. It’s the most beautiful pantry staple. Rose is highly recommended as it’s known to be cooling and soothing to the heart and mind in stressful situations. It also enhances and supports overall metabolism and rejuvenates the digestive tract, colon and liver. This uniquely silken butter is a pantry staple mostly because of its insane deliciousness that begs to be eaten from the spoon as a snack, but also because it makes an amazing almond milk when blended with water — it’s very different than using even a raw almond butter. 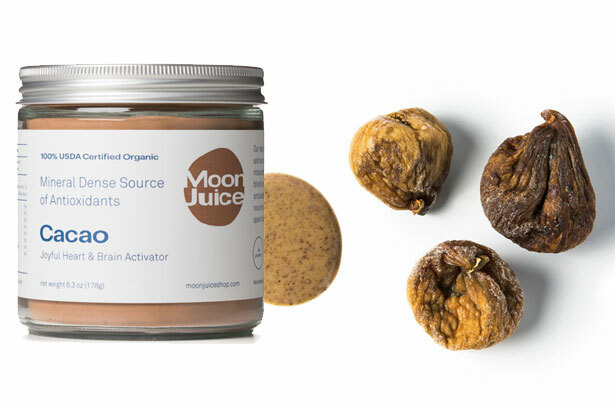 This raw, bio-available miracle food is enzyme-rich, provides an alkaline, mineral-dense, complete protein, is loaded with vitamin E, omega-3s, calcium, B vitamins and is a powerful antioxidant that nourishes your skin, nervous system, muscles, bones and heart.